Tottenham ended a run of six games without an away win by beating 10-man Stoke at the Britannia Stadium. Spurs took the lead when Emmanuel Adebayor crossed for Danny Rose to head in powerfully at the far post. Stoke had Ryan Shawcross sent off for a second booking after fouling Rose, who was booed by the home fans and shoved Geoff Cameron before being substituted. Steven N'Zonzi headed wide and Marko Arnautovic had a shot saved for the Potters before Spurs saw out the win. Shawcross's dismissal after 52 minutes had contributed to a fiery atmosphere at the Britannia and the home side - seemingly fuelled by a sense of injustice - subsequently created the better chances as they went in search of an equaliser. Spurs stubbornly held on, however, to remain sixth - three points adrift of fifth-placed Everton and four behind fourth-placed Arsenal, who have a game in hand. 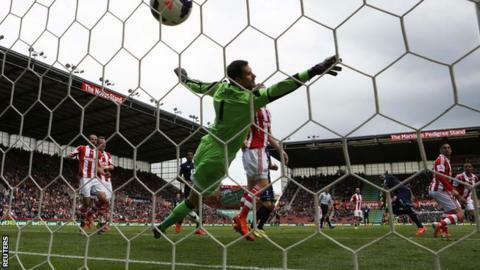 Stoke, safely in 10th, had been chasing a fifth consecutive home win and, once Potters keeper Asmir Begovic had palmed away an Aaron Lennon cross before it sneaked in at the near post, the home side gradually began to assert themselves. Stephen Ireland flashed a shot wide from the edge of the area for City before the visitors scored the opener. Adebayor touched the ball past Glenn Whelan, raced past the midfielder and sent a cross over to the far post where left-back Rose headed in for his first league goal of the season. Stoke boss Mark Hughes had been annoyed by some of referee Andre Marriner's decisions during the game and his mood deteriorated when captain Shawcross was sent off. The centre-back, booked for an earlier challenge on Christian Eriksen, caught Rose with a late kick to get a second yellow card. The home fans were incensed by Rose's reaction to the tackle, however, and constantly booed the left-back, who was again at the centre of controversy when he picked himself up from a rugged Geoff Cameron challenge and shoved the right-back to earn himself a yellow. Spurs boss Tim Sherwood took the defender off as Stoke seized the initiative, despite being a man down. Arnautovic poked a shot wide when he might have done better to feed the ball wide to the unmarked Peter Odemwingie, before N'Zonzi headed wide. Spurs keeper Hugo Lloris then smartly parried another shot from Arnautovic and later gratefully gathered again from the livewire Austrian, who should perhaps have been more clinical after being played through on goal. "First and foremost, I would like to say that I am absolutely proud of my team given circumstances in the game that put us at a disadvantage. To a man, I thought they were excellent. "Ryan, for his second yellow card, has made a genuine attempt to win the ball. It is a foul but not a yellow. "Referee Andre Marriner played on and then went back to the situation and I think he had forgotten he had already booked him. For a senior referee to not know who he has booked and then book someone for which the consequences are a red card, that is poor. "Following that Rose has raised two hands to an opponent and it is a red card. I don't understand that decision. If you raise your hands then everybody knows it is a straight red. "I think if we had had 11 players on the pitch we would have won comfortably." "I thought it was two yellow cards [for Shawcross]. "I haven't heard that kind of support anywhere for a very long time. They [the Stoke fans] really got behind their team and Mark set them up brilliantly when they went down to 10 men. "We didn't play particularly well in possession. We let them have the initiative but at this stage of the season it is about getting the three points and digging in. "I've told Danny Rose he has to use this as a learning curve. I didn't want to take him off but I had to diffuse the situation." Match ends, Stoke City 0, Tottenham Hotspur 1. Second Half ends, Stoke City 0, Tottenham Hotspur 1. Attempt saved. Paulinho (Tottenham Hotspur) right footed shot from the centre of the box is saved in the bottom right corner. Assisted by Gylfi Sigurdsson. Marko Arnautovic (Stoke City) is shown the yellow card for a bad foul. Attempt missed. Harry Kane (Tottenham Hotspur) right footed shot from the centre of the box misses to the right. Assisted by Younes Kaboul. Attempt missed. Geoff Cameron (Stoke City) left footed shot from outside the box is too high. Assisted by Glenn Whelan. Offside, Stoke City. Marc Wilson tries a through ball, but Oussama Assaidi is caught offside. Attempt saved. Steven N'Zonzi (Stoke City) right footed shot from outside the box is saved in the centre of the goal. Assisted by Marko Arnautovic. Hand ball by Paulinho (Tottenham Hotspur). Attempt saved. Marko Arnautovic (Stoke City) left footed shot from the right side of the box is saved in the centre of the goal. Assisted by Asmir Begovic. Younes Kaboul (Tottenham Hotspur) wins a free kick in the defensive half. Attempt missed. Marko Arnautovic (Stoke City) left footed shot from the right side of the box misses to the left. Assisted by Geoff Cameron. Offside, Tottenham Hotspur. Ezekiel Fryers tries a through ball, but Emmanuel Adebayor is caught offside. Delay in match Andros Townsend (Tottenham Hotspur) because of an injury. Attempt missed. Gylfi Sigurdsson (Tottenham Hotspur) right footed shot from outside the box misses to the left. Gylfi Sigurdsson (Tottenham Hotspur) wins a free kick in the attacking half. Attempt blocked. Marko Arnautovic (Stoke City) right footed shot from long range on the left is blocked. Oussama Assaidi (Stoke City) wins a free kick on the left wing. Foul by Gylfi Sigurdsson (Tottenham Hotspur). Attempt missed. Harry Kane (Tottenham Hotspur) header from the centre of the box is too high. Assisted by Ezekiel Fryers with a cross. Offside, Stoke City. Steven N'Zonzi tries a through ball, but Oussama Assaidi is caught offside. Corner, Stoke City. Conceded by Hugo Lloris. Attempt saved. Marko Arnautovic (Stoke City) left footed shot from outside the box is saved in the bottom right corner. Assisted by Erik Pieters. Substitution, Tottenham Hotspur. Ezekiel Fryers replaces Danny Rose. Attempt missed. Steven N'Zonzi (Stoke City) header from the centre of the box is close, but misses to the left. Assisted by Marko Arnautovic with a cross. Attempt missed. Marko Arnautovic (Stoke City) right footed shot from the centre of the box misses to the left. Assisted by Steven N'Zonzi. Attempt missed. Peter Odemwingie (Stoke City) header from very close range is too high. Assisted by Erik Pieters with a cross. Substitution, Stoke City. Oussama Assaidi replaces Peter Crouch.